and took a photograph, long since lost, of these words . It looked very much like the one below. Why am I writing about this? Because some months ago I was contacted by Stephen Liverman, an organizer of the Ashbourne arts festival in Derbyshire. Stephen asked if I would like to be part of the festival, leading a poetry workshop, giving a reading and judging the children’s poetry competition, the theme of which was ‘Stranger’ . It was my great pleasure to accept this invitation, and some time later a parcel of poems arrived. The theme gave the children an opportunity to explore the word ‘stranger’, either as in the phrase ‘stranger and stranger’ or denoting someone unknown to us. While, perhaps unsurprisingly, there were many poems about the potential danger of strangers – after all it is important for children to have a basic understanding of how strangers should and should not behave and how to respond – I was looking for poems that approached and explored the theme imaginatively from different angles; poems which captured an individual’s thoughts and emotions, as well as poems which were funny, surprising and quirky. As well as sounding good when read aloud, I was also looking for poems which were well-made in terms of their shape – poems that used rhythm and rhyme in subtle and interesting ways, and poems where it was obvious that some thought had been given to the way the poem appeared on the page. I was delighted to find thought-provoking poems, poems which made me laugh and poems that told interesting stories. Which brings me to the content of the poems. The UK recently voted by a slender margin to leave the European Union and the aftermath of the result has had one appalling consequence, namely a dramatic rise in the number of racially motivated attacks and abuse in the UK. During this campaign and many others before it, the fear of immigration, of the impact of ‘foreign elements’ on economics and culture was exploited. It seems to me that now, as always, it is important to enable children to explore themes of difference and commonality. We all have a responsibility to encourage young people to engage with these themes; however, it seemed a pity that this opportunity had been overlooked by many of the schools who entered their student’s poems to the competition. Much of the work concentrated on fear of strangers and of their potential to cause harm. Not only does this twelve-year-old writer demonstrate the questioning approach that must lie at the heart of a civilized and compassionate society, he also concludes the poem by resolving to take action, to go to find out what had happened to make the person in the poem homeless. If there is any hope for a confused and frightened world, a world in which ‘strangers’ are vilified and notions of ‘Us and Them’ are exploited by those who would profit, it surely lies in the sort of empathetic inquiry and determination to understand that is at the heart of this child’s poem. Thanks for sharing your judge’s response to the children’s poem entries, and for the link to all the winning entries which I’ve just enjoyed reading very much. Yes, children are capable of empathy that often belies their age. Last year, I read a letter written by a year 5 boy, which the deputy head had displayed outside her office door. It was to a political prisoner sentenced to execution for his beliefs. It was a spontaneous response to an article he’d read online, as opposed to a classroom written task. It stopped me in my tracks. Thank you Jayne. I like your anecdote. Great that the deputy head displayed the work and felt able to share work produced outside of school. Excellent and pertinent post Roy- thank you. 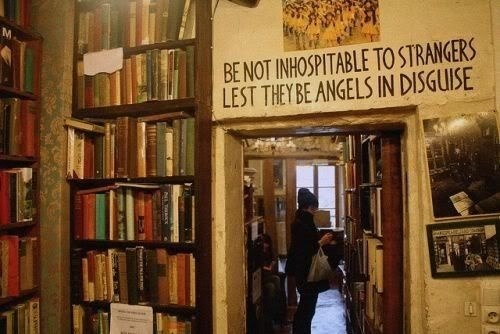 As an aside I love Shakespeare & Co which is a delightful anachronism – an American bookshop celebrating an English writer, situated on the Rive Gauche. Says it all about delighting in difference whilst recognising what we have in common. A very pertinent post that reminded me to look beyond the superficial presentation of a person and recognise our common humanity.